The A.O.U. this month published (The Auk 129(3):573-588, 2012) a long-anticipated split of the Xantus's Murrelet that will greatly affect pelagic birders off western North America. The Scripps's Murrelet (Synthliboramphus scrippsi) is now the name of the former Xantus's Murrelet nesting on the Channel Islands off southern California. Sibley called it the "Northern" Xantus's Murrelet. The former nominate form of Xantus's Murrelet did not keep its name either, though it does keep its scientific name. Guadalupe Murrelet (Synthliboramphus hypoleucus) is now the name of the former Xantus's Murrelet breeding off Baja California, Mexico. Sibley called it the "Southern" Xantus's Murrelet. In this post "Xantus's Murrelet" refers to both Scripps's and Guadalupe Murrelet. I know, it's a bit confusing. While neither of the "new" species are rare in California, that is not the case northward on the West Coast. 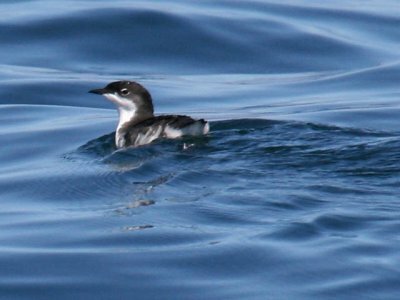 The Oregon Bird Records Committee (OBRC) dropped Xantus's Murrelet from its Review List in 2010, having determined that this species is now expected annually far offshore in warm water. However, there is one accepted record assignable to the new Guadalupe Murrelet. There are also several reports of this form not reviewed by the Committee. Many of the accepted reports on the Oregon List are not definitely assignable to one or the other of the new species. Thus, these ambiguous records will need to be assigned by the Records Committee to "Scripps's/Guadalupe Murrelet" and assigned new OBRC numbers. That's not so bad, except for one problem. Because of the similarity of Xantus's Murrelet to Craveri's Murrelet (Synthliboramphus craveri) there is already a "Xantus's/Craveri's Murrelet" on the OBRC list. "Scripps's/Guadalupe/Craveri's Murrelet," anyone? I guess "Synthliboramphus species" might be acceptable, though Ancient Murrelet and Japanese Murrelets are also in the genus Synthliboramphus (hey, I'm starting to get the spelling right without looking!). OK, a bit of ID. Craveri's Murrelet has dark wing linings and dark chin (very small feathered area above the throat between the forks of the lower bill). The bill is thinner than Xantus's. The lower face is white, the upper face and ear coverts, including the region surrounding the eye, is dark. The face of Scripps's Murrelet is similar to Craveri's, with the eye in the dark part of the face (often a white wedge in front of the eye, though). Wing linings and chin are white, however. Not that this does any good with birds swimming away, diving, or flying directly away at high speed as they are wont to do. When diving birds pop back to the surface they may flap briefly to dry their wings. Or, when swimming away they may look back over their shoulders and give a quick view of their chin. Adult birds may swim north with their chicks. Thus, if the chick is small enough they may stay in one area, diving rather than flying; you may end up with great views. If the birds get separated they call back and forth. The face on Guadalupe Murrelet has the eye surrounded by white, making identification easier--as long as you're sure to eliminate the Alaska-breeding Kittlitz's Murrelet! So, are you familiar with the piping whistle of Pigeon Guillemot? It is a series of notes speeding up and running into a thin drawn out sweeeeer, dropping in pitch at the end. It lasts a good 2 seconds or more. Scripps's Murrelet gives a similar-starting loud rapid call of 6-8 evenly-spaced notes, all on the same pitch. I have actually heard these calls from unseen birds while I was on the upper decks of a cruise ship! Guadalupe and Craveri's Murrelets have a rattly trilled call, quite different. Xantus's Murrelets arrive in summer off Oregon with warm blue "tuna" waters (>58F). Off Oregon they are seen on oceanic and nearer slope waters (100-1000 fathoms [200-2000 meters, 600-6000 feet deep]), generally well over 30 miles offshore, depending upon water temperature. July would be a typical early date, most would be gone by early October (OBRC dates June to mid-November). Most traditional pelagic trips from Oregon go offshore only about 25 miles, which isn't quite far enough for regular encounters. Thus, to best find either of these two "new" species, you must either take a September repositioning cruise on a luxury liner offshore 60 miles, or join a deep water pelagic trip. As per expectations foreseen in Steve Howell's new seabirds book, the A.O.U. published the official split of the Galapagos Shearwater off western Mexico from other forms of Audubon's Shearwaters in the Atlantic. The Galapagos Shearwater isn't listed or even mentioned in the new National Geographic guide (6th Edition), but the map for Audubon's Shearwater shows the range in western Mexico, which now refers to Galapagos Shearwater. The Galapagos Shearwater is unlikely to occur in the United States, but seabirders should be aware--just in case! It has been 7 years since the last major overhaul of our website. Since then computer monitors have become shorter and wider. So the 4:3 aspect ratio no longer looked up-to-date. Websites on the new wide-screen (16:9) aspect ratio of most recent monitors looks better with multiple columns. And I added many more photos to the opening page, showing seabirds and birders enjoying seabirds. It now looks more modern and less spartan--though I am a big fan of clean-looking pages. I've simplified the pages into a 3-step format: Choose Your Pelagic Trip, Reserve Your Space, and Prepare for Your Trip. It should now be easier to find helpful information, including a new combined Annotated Checklist with Semimonthly Abundance Bar Chart and Recent Sightings Archive--all on one page now instead of three. Anyway, take a look and see what you think. And if you find any problems, broken links, browser issues, or other things that don't make sense, please let me know so I can fix them. Thanks. 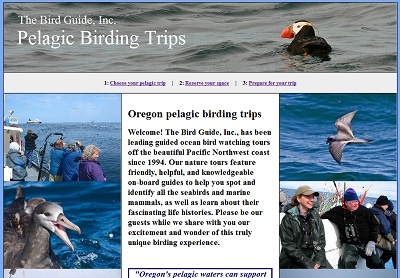 Visit The Bird Guide's Pelagic Birding Trips page.